With its warm, soft-edged beam, zoom and rich CMY color mixing, Martin’s MAC TW1 tungsten wash light has always been an excellent choice for live music touring shows. One recent example is Bombay Bicycle Club’s recent UK tour, the English indie band’s biggest headline tour to date. 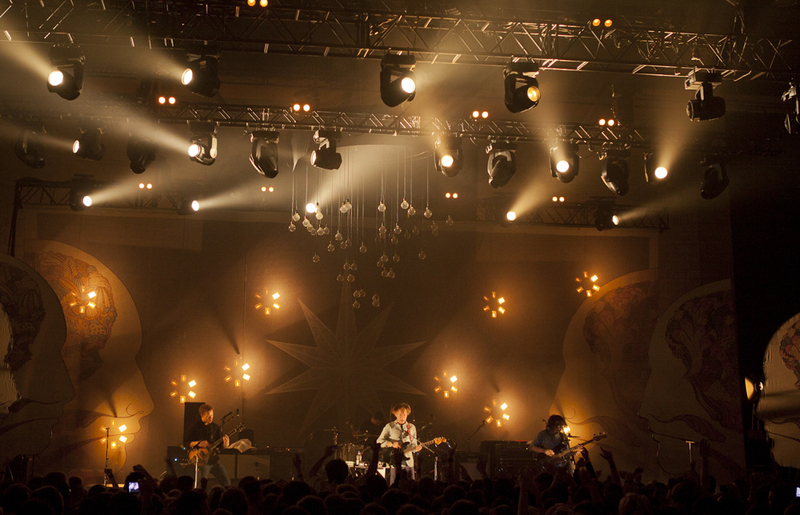 Lighting and set design for the tour was by Squib and marks the second Bombay Bicycle Club tour he has used the TW1s on. Forming the bulk of the moving light aspect of the rig, Squib placed six TW1s each on front, mid and back truss for a total of 18. Squib’s lighting design made use of 160 dimmable fixtures including pendent light bulbs, space lights, Fresnels and Moles, which gave the show a warm tungsten look. Squib comments, “I wanted a wash light that fitted in with this aesthetic but one which I could also get a full range of other complementary colors out of. The TW1 fitted the bill perfectly and I was really able to experiment with color temperature by using them at 20 or 30% as well as at their full intensity. They complemented the rest of the lighting rig perfectly.” Also in the rig were Atomic 3000 strobes placed on the floor behind the band for big punch backlight looks. Lighting equipment for the band’s first full production tour, which culminated at Alexandra Palace in London, was supplied by Neg Earth with the TW1s sub-hired in from Richard Martin Lighting. Lighting was project-managed by Simon Alderman and Lindsey Markham of Neg Earth with Dom Martin as crew chief and Rob Watson as lighting tech.